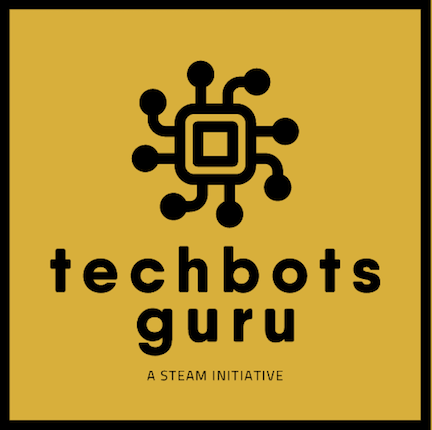 TechBots Guru is an initiative to encourage kids of all ages to develop an interest in how the things around them work. Today, Kids are so tech savvy that it is so easy for them to understand how to use any new smartphone, tablets & other devices. We at TechBots Guru want to expose the Kids to technology in such a way that instead of being mere users, they become the Makers. Science, Technology, Engineering, Arts and Mathematics (STEAM) are the pillars of academics. Science has always been in the world around us. Today, Technology is continuously expanding into every aspect of our lives. By exposing kids to STEAM topics early, we can plant the seed of curiosity in them. Our programs are planned in a way to show real-life implication of STEM while taking Arts as integral part of all our projects. Our programs will help kids enhance their critical thinking and Analytical skills. These skills will always help then in whatever they do! Bots, Cars & more - Can I convert my pencil box to a moving car ? Can I light up those street lights? How can I make a 3 legged robot? Come and explore these ideas. We believe that Kids have some of the brightest thoughts. Let them have that wild idea and give them the platform to work on it! Learn to Code - Invented by MIT, Scratch Programming enables individuals to program interactive stories, games and animations. We will be using this platform to teach coding to kids. While understanding the fundamentals of coding in a fun way, Let your kid create games instead of just playing them. Arduino Robotics - Arduino is a microcontroller with easy to use hardware and software. Learn the basics of Robotics while tinkering with Arduino and Design and Program your own Arduino based smart robot.